This delightful anthology includes my poem, "A Fishy Tale". I was delighted to see that the poem has its own full page illustration. The print version is fully illustrated, more or less A4 size, 146 pages, and obtainable directly from the publisher, or you can download the entire anthology here: http://www.durham.net/~neilmac/travelerstales.htm. The best works of more than fifty contemporary authors are included in this delightful anthology of modern, rhyming poems for older children. 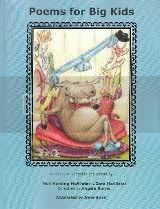 This book covers the spectrum of children's verse: stories with a moral, animal friends, nonsense, reflections about the family and growing up. Authors from Canada, Australia, the USA, the UK, India, France and beyond combine their talents to make this an eclectic and entertaining collection for big kids - and their parents.